Workflows that enroll companies. This new type of workflow allows you to set properties, create tasks, and send email based on companies. Many of you probably have a company-focused strategy and do account based marketing (ABM), instead of a contact-focused strategy. Until now you’ve only been able to center automation around contacts, and recently we added the ability to automate deals and tickets. Now, you can also create tasks attached to companies, set company properties, and send emails based on companies. Go to Workflows, create a new workflow, and you’ll see new options to create a company-based workflow. For now, the actions available in these workflows are setting properties, creating tasks, and sending email (to send email, customers must also have Marketing Pro). We’ll continue adding more functionality to these workflows to match what can be done in contact-based workflows. 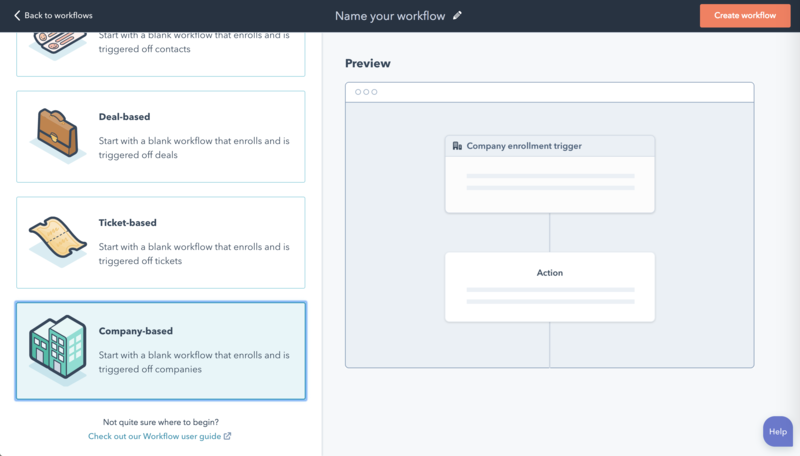 Company workflows are available for any Pro-level customer, but sending an email from a company workflow is only available to Marketing Pro and Enterprise customers.